February has arrived. And unfortunately for many of you loyal readers, I hear Punxsutawney Phil prescribed a LONG winter yet to be had. (To which my Jefe lovingly asked “who is Punxsutawney Phil? !” and I immediately whipped out Groundhog Day.) So while you’re bearing the inches of snow and blustery wind Mother Nature is still sending your way, cozy up with a cup of hot cocoa and Bailey’s and do a little window shopping with me! 2) West Elm Elton Settee – Although we are not in the market for any sort of love seat, I’m in love with the subtle curved lines, traditional tufting, yet overall modern feel of this piece. And the blue fabric is to die for! 3) Nate Berkus Lamp – I can’t believe this beauty will soon be available at Target. Yet again, Nate Berkus knocks it out of the park with this modern piece of glam. Look at those lines! The inner shade’s lining! GORGEOUS. Also reminds me of the little Land of Nod lamp I used for my Dorm Room Decor Round Up! 4) Lulu & Georgia Print – Is there anything Jenna Lyons isn’t right about when it comes to design?! Now about the $300 price tag of those calf hair leopard flats I want…. 5) Nate Berkus Hexagonal Wood Tray – I’ve already seen this piece explode across the blogosphere and I am totally jumping on the band wagon. If it had handles, it would already be in my apartment looking for a permanent place to live and corral things. And after having seen it in person, I honestly was astounded at the quality of the piece for the price. Bravo, Mr. Berkus. 6) Sam Edelman Cheetah Loafers – So about those JCrew shoes… I’ve found your younger sister and my wallet loves her so much more. I happened to see a coworker wearing these with a simple, jersey knit heather grey dress and it was the perfect mix of comfortable chic for the office. I must have. 7) Baublebar Slim Bow Pendant – I’m obsessed with costume jewelry lately. And Baublebar has such fabulous sales (and credit for purchases made) that I never pay full price. This one had me at hello so I snatched it up for $10. It’s the perfect accent against my favorite emerald silk blouse. 8) Magic Carpet Yoga Mat – Yes. Yes. Yes. I’ve been wanting to get back into my yoga practice and this is the PERFECT incentive. 9) Baggu 13″ Polka Dot Laptop Sleeve – Last weekend I was at the Apple Genius bar for a tune up for the old laptop. This adorable case caught the corner of my eye. Five minutes later I was walking out with it. It also happens to PERFECTLY complement the Baggu I got for Christmas (and yes, I actually kept and have been using the iPad case too! It’s a perfect little set, although a little tough to get the iPad in and out). 10) Baggu Small Leather Pouch / Gold – So I’m a little Baggu obsessed right now. But as my wallet won’t fit in my new Kate Spade purse, I need something to corral my cards and (small) amount of cash when I’m on the go. This gold little pouch would be perfect! 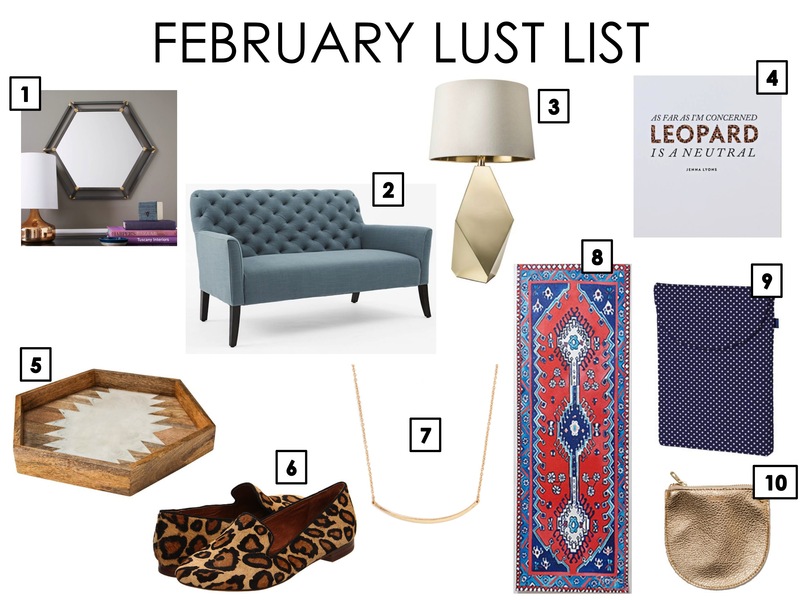 Well there you have it, February’s Lust List. What are you lusting after these days?